This archival photo found in the lobby of the Essex House hotel, reveals the tall North Wall of Vista Rock. Photo appears to have been taken before the creation of Turtle Pond. Judging by the low building to the left, the Receiving Reservoir had not yet been filled in to create the Great Lawn (the water in the image is the southern portion of the reservoir). 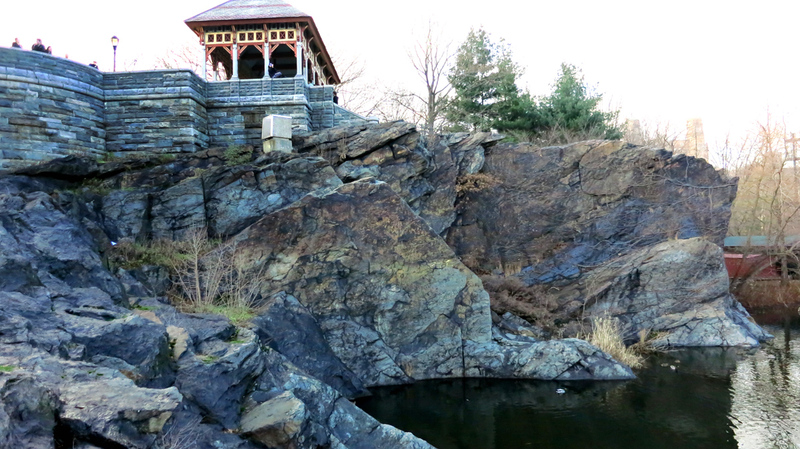 Also absent is the Delacorte Theater. 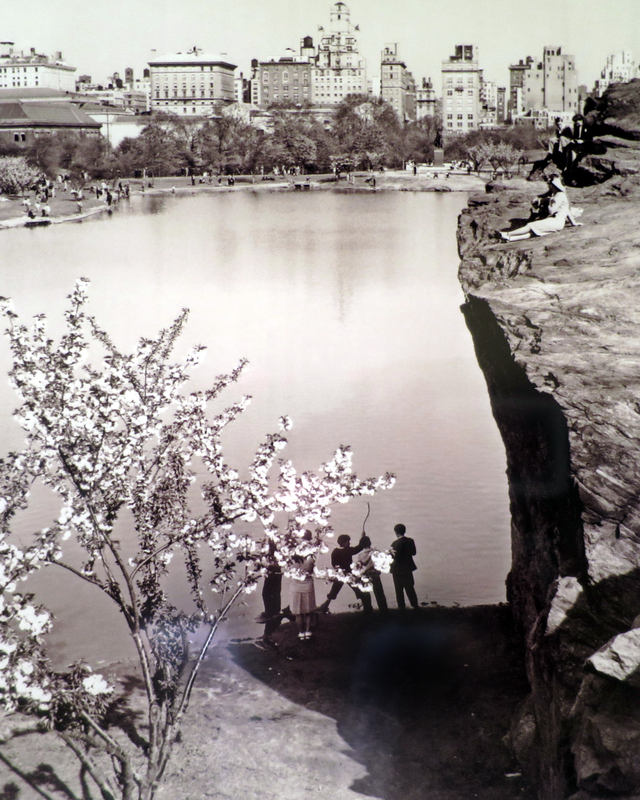 This picture shows how, before the Delacorte was built, there was free and easy access to the steep northern wall of Vista Rock. 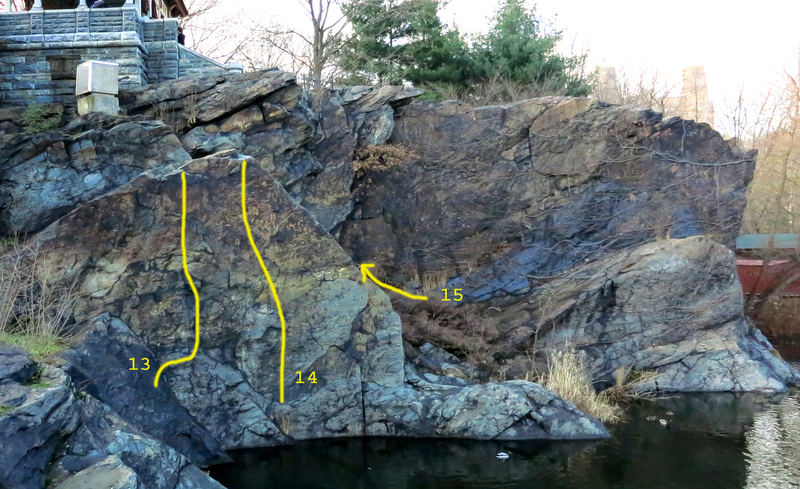 Were this section of Vista Rock to once again have this sort of open access and low water level, this clearly would be the best bouldering area of Central Park. Start: On the slabs adjacent to the rust-colored east face of the Friction Slab block. Move onto the east face of Friction Slab block and reach a small stance on a narrow, sloping ramp. Go: Straight up the shallow blast hole line via a large, but loose hold halfway up the face. *Great climbing with a bad landing. Start: A few feet right of Rusty, where two narrow, sloping ramps intersect at the lowest point just above the water. Go: Up and ever so slightly left as you climb toward the apex of the Friction Slab block. Start: At the base of the Friction Slab block that juts out from Vista Rock immediately south of the Main Wall. Go: Friction climb any part of the slab. The left side is exposed, but has the edge of the block to use and some bigger foot holds. The right side has the big overhanging corner to use in case friction is not enough (though awkward). The middle part of the slab is the hardest. *Extremely fun. Sticky rubber makes some of the climbing far too easy. Though be careful of the polished, slick bits. Start: At the left or right side of short, east-facing wall at the top of the Friction Slab block and just below castle gazebo. Go: Traverse left or right without using top of wall.